Ritz is an industry leading party bus operator because we deliver exactly what our client want in party bus service. We offer the most luxurious and clean limo party bus rentals inside and out. Every limo bus is regularly detailed and cleaned before each new service. We provide our clients with the most affordable party bus rates. We offer many private bus, mini-bus and shuttle options to choose from in both black and white colour options. Our party buses are designed for groups ranging in size from 10-40 passengers. Every limo bus has custom stitched, comfortable leather seating, luxury interior finishings and state-of-the-art entertainment features including custom sound systems, flatscreen TV’s, i-pod connections, starlight ceilings, bar service areas, hardwood floors… Climate controls, tinted windows and privacy dividers all come standard, with the controls operated by you. Ritz has been a premier party bus operator for over 20 years. Our many years of service allow us to deliver a level of customer service that is simply unmatched in our industry. Our in-house staff of professional bus drivers are true professionals with many years operating these types of larger vehicles. Our bus chauffeurs will take every opportunity to go out of their way to surpass your level of expectation. Our entire fleet of limo party buses are winter equipped and are your safest option for transport to Whistler BC. We have your airport transportation for larger groups covered. Our airport bus fleet has lots of cargo storage for luggage and equipment. Large, spacious interior cabins are designed for groups of up to 40 passengers. Ritz provides private bus transportation to Vancouver international airport, Seattle international airport, Abbotsford airport and Bellingham airport from any pick-up location. We also offer airport meet and greet services for large family gatherings, wedding parties, and corporate clients coming to Vancouver for meetings, trade shows and special events. Did someone say concert? Take your concert night to the next level with a party bus service for you and your friends. Get the party started right away with blue tooth and i-pod connections so you can play your music while you travel in style to the concert. A custom sound system with sub woofers is fully controlled by you from the passenger cabin. We also carry a large assortment of music on board and have satellite radio too. 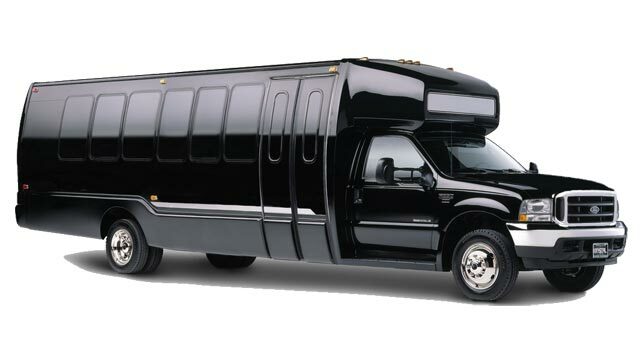 Our private limo bus service is an affordable and safe way to travel. Don’t worry about event parking, long walks to the front gate or bad weather. We can pick up everyone in your group at their desired locations and deliver them all right to the front gate. You don’t have to pay for us too sit while you are in the concert. We can arrange a pick-up time and location that suits you following the event. Our concert party buses can hold up to 40 passengers but can be booked in any size that works for your group. Our concert party bus service is the most economical way to travel around Metro Vancouver for all your concert events. For the bride and groom, their wedding party and for family and guests our wedding limo buses are simply the best. Clean, white limo buses have lots of cargo space and luxurious interiors that make for super comfortable and safe wedding transportation for large groups of people. Our limo buses can be decorated to suit the theme of your wedding. Or just go with our standard but elegant bow set. We can work with your wedding planner to make sure that every detail of your wedding bus transportation service is perfect. Complimentary water and ice storage will be available for all those travelling with us on your special day. Our private bus transit to Whistler BC is fast, affordable and safe. Every vehicle is driven by a professional chauffeur with lots of experience driving the Sea-to-Sky highway. Our Whistler limo buses are fully equipped to handle winter driving conditions and are by far the safest way to travel to Whistler BC. Limo shuttles and buses can carry ski equipment, mountain bikes and up to 40 passengers. We deliver one-way and round trip Whistler bus transportation services. Our grad party bus services are perfect for large groups of students arranging private transportation or for schools looking for limo bus transportation for entire graduating classes. Our fleet of grad limo party buses have luxury interior finishings and all the modern entertainment features you could desire from custom stereos to flatscreen TV’s. Bring your own music or listen to ours! Our private grad transportation services are great for large groups looking for affordable transit to grad events anywhere in the Metro Vancouver, Fraser Valley and Whistler region. Looking to charter a private bus for a tour group or sightseeing tour? Our fleet of limo buses and shuttles are a great option for those looking for sightseeing tours in Vancouver and Whistler. Ritz offers private sightseeing tours throughout Whistler, downtown Vancouver, Stanley Park, winery tours in Kelowna, Penticton and South Surrey, craft beer tours, shopping tours, Gas Town and Christmas light tours in the winter months. We take pride in offering Vancouver’s most luxurious and reliable private bus transportation and bus tour services at affordable rates. If you have any questions or need advice on planning a private sightseeing tour or renting a private tour bus please feel free to contact us at your convenience. It has never been so easy to book a limo bus, party bus or shuttle transportation service. Our customer service department is standing by to take your calls, answer your emails and take booking requests. We look forward to providing your next limo bus service.